Step 1 Cook bacon in 5-quart stockpot or Dutch oven over medium heat until browned, 5 minutes. Remove with slotted spoon to plate. Set aside. Pour off all but 2 tablespoons bacon fat and return pot to medium heat. Add onion and celery. Saute until vegetables are soft but not browned, 3 to 5 minutes. Step 2 Add potatoes, squash and turkey stock or broth. Bring to boil, reduce heat to a simmer. Partially cover pot, and cook until potatoes are tender, about 15 minutes. Add zucchini, Swiss chard, turkey, sage, thyme and reserved bacon. Cook 5 minutes longer. Add salt and pepper to taste. Ladle soup into warm bowls or mugs. In Recipes-list.com we have selected the most viewed recipes from category - Leftovers Main courses Soups . Enjoy the best recipes specially selected for you! 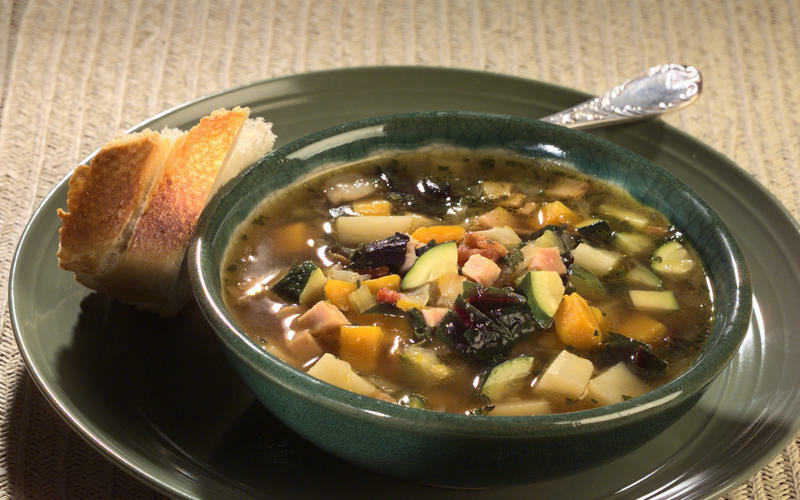 Roast turkey and winter vegetable chowder is the right choice that will satisfy all your claims.